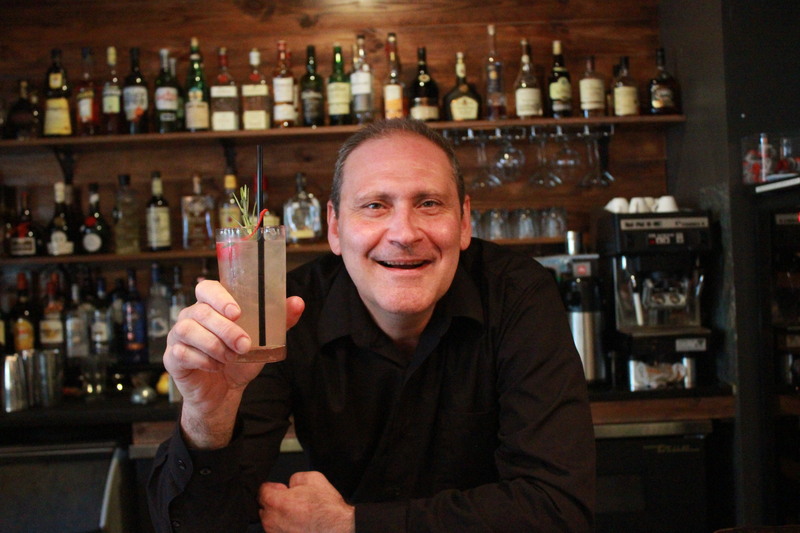 Steve serves up a Ginger Collins – you have your choice between vodka or gin! 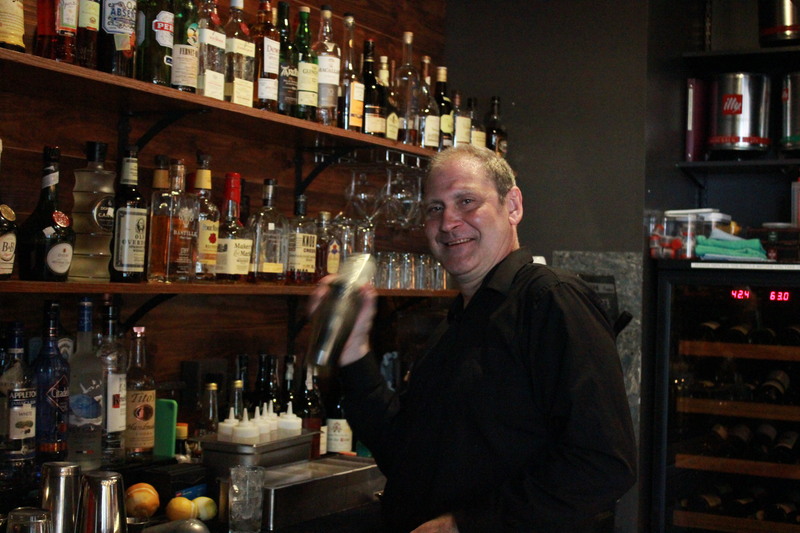 Steve is behind the bar Tuesday, Friday, Saturday nights and Sunday day and night. When I was 20 years old my older brother was working in a family restaurant in Mattapoisett , MA. I’m from a small town in southeastern MA called Fairhaven where everybody knows each other. 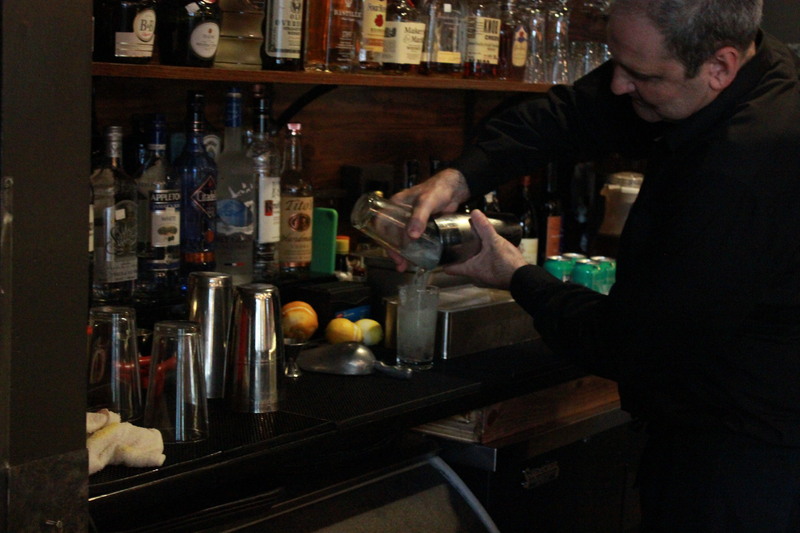 They needed a bartender for some short shifts during the busy dinner rush so I worked with my brother. He cracked the whip while training me because he did not want me to embarrass him….or myself for that matter. Some tough love was applied. I learned quick! Everything has a place so….if you use or touch something, please put it back where it came from. If I had a quarter for every time I said that I would be in the Florida Keys with Jimmy Buffett. What is the most clever line anyone has used to garner a free cocktail from you? A gentleman came in the bar where I was working and had me pour a shot of bourbon and a shot of water. He said if he could put the water in the other glass and the bourbon in the water glass without using another glass or his mouth, would I buy him the bourbon. I bit. He pulled out his drivers license and put it on the shot glass with water, tipped it over on the bourbon shot glass and slid the card a hair. The liquids change glasses water is heavier than bourbon and gravity did the rest. He got his shot! “Lend me some sugar, I’ll be your neighbor”. And……yes if anybody is asking, I am available! Tell us an interesting encounter you have had with a patron. I was in the kitchen grabbing food for a customer and the other bartender on duty came in to the kitchen and said she “needed” me. A guy at the bar had asked for a Bud. She asked for ID while opening the beer and putting it on the bar. I walked up to him from behind the bar and asked for ID also. He just kept pushing his credit card toward me shaking his head no. I grabbed the beer off the bar, gave him a menu and told him without ID we can’t serve you alcohol but you can have a juice, soda or some food. He kept pushing his credit card towards me. I told him to pick up his credit card since there had not been any service or goods exchanged. He stood there for a couple minutes not saying one word. I waited on other customers. Eventually, he looked at me and pointed to the end of bar indicating he wanted me to meet him there. Keep in mind still no words were exchanged. He pulls out his wallet and shows me an ABC badge, nods “OK” and walks out never saying one word. People in the industry be careful. Red Auerbach (GW grad), I always wanted to know, while smoking his cigar in the Garden, who the good looking blonde that sits right behind him was. He must have some have good stories about the great Celtics. Franklin Delano Roosevelt & Winston Churchill and listen to them exchange stories. I would say JFK but if we invite Marilyn Monroe she will have some great stories about John and maybe Bobby. She would certainly be a hit and easy on the eyes. I would like to take this opportunity to say that Michelle and Christophe have put a wonder restaurant together with a kitchen that will rival anyone. They kept some of the quality staff from Bastille and Dina (the GM) has blended the new and the old employees very well. 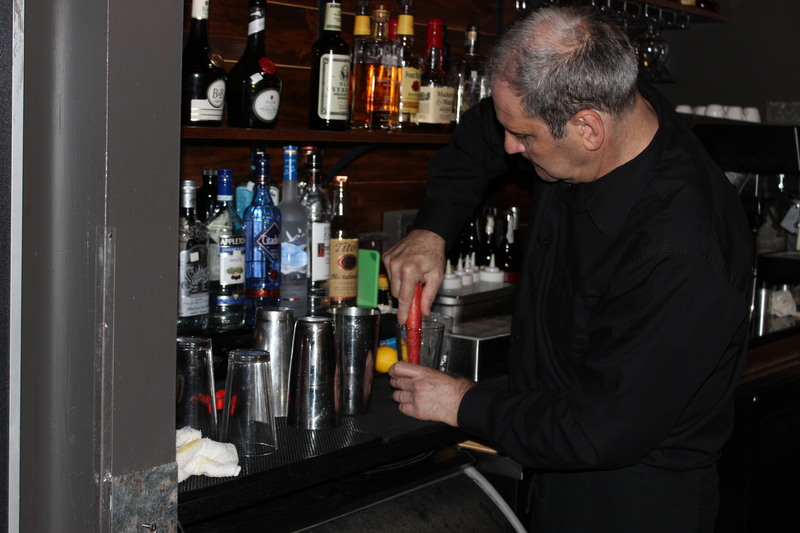 Chef Sal takes a lot of pride, his second hand Mixer (who I like to call Sir Mix – A Lot), Gilbert, and the rest of the kitchen staff make it easier on the front of the house. 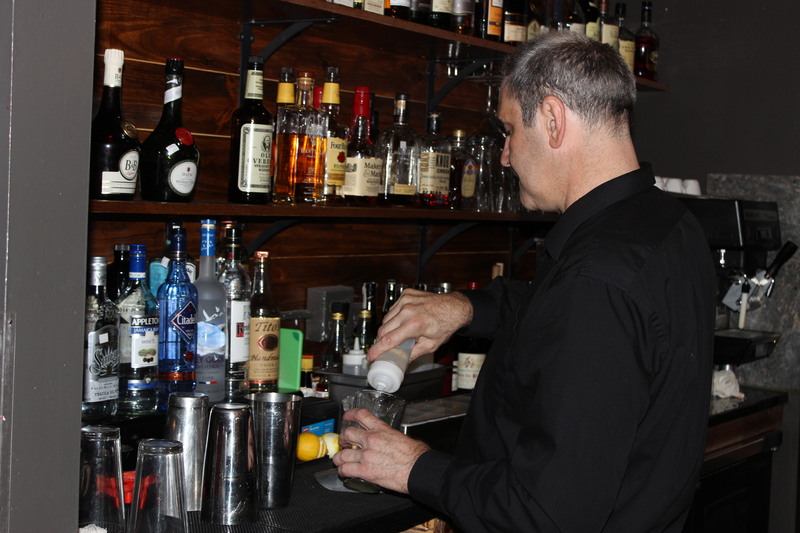 If you would like to see your favorite mixologist featured here, send contact information to office@oldtowncrier.com.